Welcome to The Stacks. Search in The Stacks for press kits, film reviews, articles and interviews concerning Early Works projects. 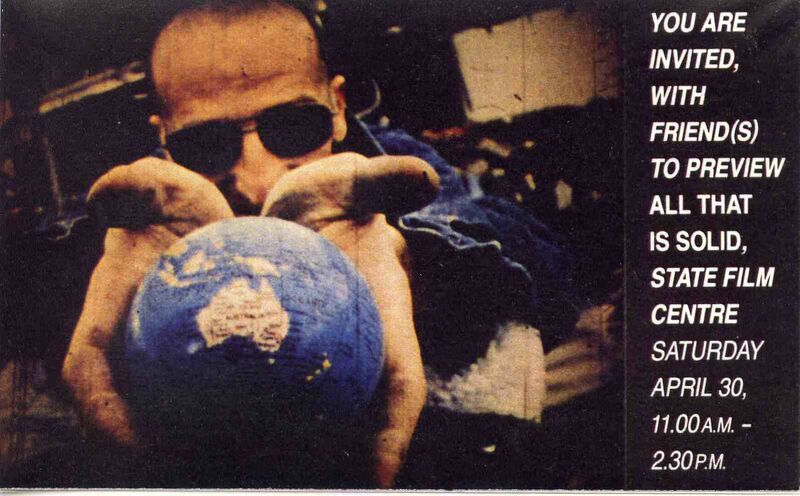 All That Is Solid film invite, 1998.
Review of All That Is Solid by Marion Benjamin. First published in In The Picture Magazine June/July, 1989.
Review of All that is Solid by John Slavin. First published in The Age Monthly Review May, 1989. Article about What I Have Written by Anna Dzenis. First published inMetro Magazine # 107. What I have written is the most recent film by Australian filmmaker John Hughes, whose directorial achievements include Traps (1986), and two ‘speculative’ documentaries‚ All That is Solid (1988) and One Way Street: Fragments for Walter Benjamin (1993). Article about What I Have Written by Barbra Luby. First published inMetro Magazine # 107. Text of a review of The Archive Project by Sandy George. First Published in The Weekend Australian ‘Review’ pg 36, January 20 – 26, 2007.
Review of The Archive Project by Natalie Craig, first Published in The Age ‘Green Guide’ pg 30 Thursday 18 January, 2007.
Review of The Archive Project by Paul Davies. First Published in Metro Magazine Issue 152. Excerpt: The Realist Film Unit began in late 1945 when Ken Coldicutt pooled 300 pounds deferred from his war service in the RAAF with another 300 pounds contributed by Bob Matthews. Together they set up a production/exhibition enterprise for making and screening alternative, activist films…. Review of The Archive Project by Simon Plant. First published in theHerald Sun 10 February, 2006. An article about After Mabo by Peter Hughes. First published in Screen Education Issue # 38. Excerpt: The political documentaries of John Hughes have shown a consistent concern for history, indigenous issues , media representation and power and After Mabo is no exception. 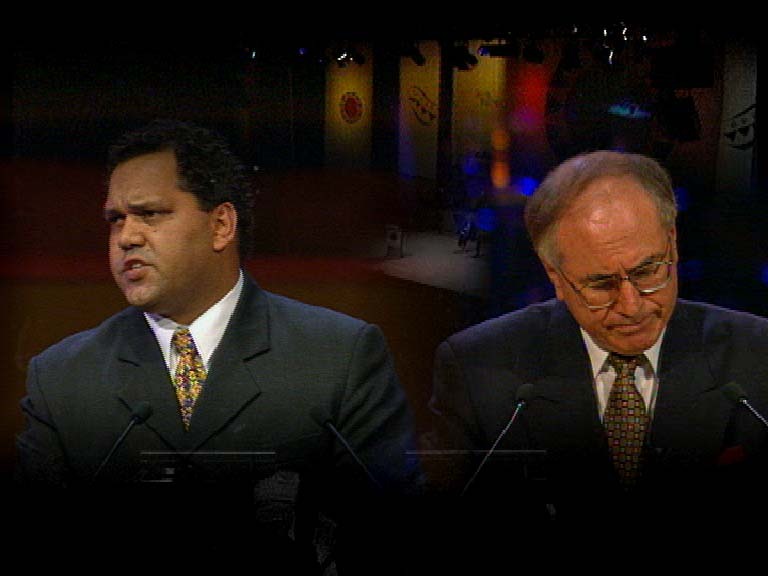 Image: Noel Pearson and John Howard. Review of Menace by Richard Fletcher. First published in The Tribune, 29 March, 1978.
Review of Menace by Hamish Grant. First published in Farrago, 14 June, 1977. A review of Menace by Colin Bennett. First published in The Age 6 June, 1977.
Review of Menace first published in Lot’s Wife, 6 June, 1977. Article about River of Dreams by Anna Dzenis. First published in Metro Magazine # 124/125. Review of River of Dreams by Asa Wahlquist. First published in The Australian 14 October, 1999.
Review of River of Dreams by Jane Freeman. First published in theSydney Morning Herald 11 October, 1999. A review of One Way Street by Marion Benjamin. First published inArena Magazine Feb-March, 1993.
Review of One Way Street by Jane Freeman. First published in The Melbourne Times 2 December, 1992. Following the release of Indonesia Calling: Joris Ivens in Australia(2009), writer-director John Hughes offers a pictorial essay reflecting on aspects of Ivens’ 1945–1946 project, a work that engaged with great urgency with contested relations within an Australian social formation divided by class and attitudes to race, and between Australian political leadership, its European war-time allies and the anti-colonial ambitions of the Indonesian Republic. A more detailed account of Ivens’ Indonesia Calling (1946) and its impacts on Australian film in the early post-war period was published in Senses of Cinema 51 (2009). Patricia Aufderheide (American University Center for Social Media) at IDFA 2009 and "Indonesia Calling: Joris Ivens in Australia". *“News from the Future of Public Media: IDFA, Ivens, Oranges and More” by Patricia Aufderheide, Nov 30, 2009. Catherine Gough-Brady reviews Indonesia Calling: Joris Ivens in Australia, “Dadaist Screen Design” ‘Dox’ # 84 Winter 2009 (pg 22 & 23). John Hughes on the impact of Joris Ivens’ Indonesia Calling for Australian documentary. First published EFJI Magazine, July 2009 (pg 39). John Hughes discusses Indonesia Calling: Joris Ivens in Australia withABC Radio Australia Breakfast Show hosts Phil Kafcaloudes and Adelaine Ng on 21 July, 2009. The Press Kit includes background on the film, production notes and full production credits. An article by John Hughes about the film Indonesia Calling: Joris Ivens in Australia in production, including background on the making of Indonesia Calling by Joris Ivens. This article was first published in theEFJI Magazine, December 2006 (pg 26-29). Image of Keith Gow from film.